It’s a terrible thing to think about, but the people who stand up for human rights are often mistreated and even killed for their beliefs. In 2009, a human rights activist named Natalia Estemirova was kidnapped and murdered while performing her important human rights work. Human rights defenders are often attacked in remote locations and their fates can remain a mystery for untold lengths of time. 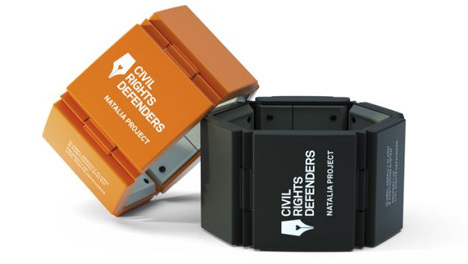 The Natalia Project was formed in Estemirova’s honor to help other civil rights activists stay safe. The project involves an alarm worn on the activist’s wrist. If the wearer is injured, attacked or abducted in the line of duty, he or she can manually trigger the wristlet’s alarm. The alarm will sound on its own if the bracelet is removed forcefully. A signal goes out to the Civil Rights Defenders and a network of committed individuals who then spread the word on the activist’s situation. The activist’s location is transmitted via the GPS located in the bracelet. All parts of the network have jobs to perform. Some send reports to news outlets, some speak to the media, some work with government officials to ensure the safety of the endangered activist. The regimes behind the kidnappings and other atrocities obviously want to avoid having their actions broadcast to the entire world, so the Natalia Project aims to shine a spotlight on them. 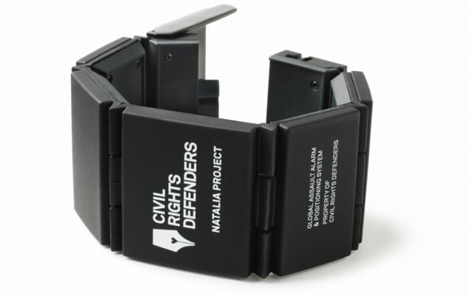 The bracelets will start appearing on the arms of civil rights workers any day now. See more in Cybernetics or under Technology. April, 2013.